A young South Shields team pulled off a superb 2-0 win at Cleethorpes Town on Thursday as they booked their place in the quarter-finals of the Integro Cup. The Mariners fielded five academy players from the start in a rematch of last season’s FA Vase final, and brought one more on from the bench. The teenagers played superbly as they helped Shields progress to the last eight, with goals from Carl Finnigan and academy midfielder Dan Lowther sealing the victory. The deadlock was broken in the 14th minute when Cleethorpes goalkeeper Sam Vince was punished for picking up a backpass. The free-kick from just eight yards out was touched to Finnigan, who rifled it low and through a sea of bodies as he scored his 20th goal of the season. Both sides had half chances in the remainder of the first half, but the closest either came to adding to the scoring was when Daniel North got in behind on the left for the hosts, only to be denied by Shields goalkeeper Paul Woolston. In stoppage time, Callum Guy did well to find Finnigan in a good position, but the striker had his effort deflected just past the post. Cleethorpes had their best spell of the game in the early stages of the second half, but were unable to find a way past Newcastle United loanee Woolston. In the 54th minute, he made arguably his most impressive save of the match as he kept out a powerful effort from distance by home captain Alex Flett with his fingertips. Jonathan Oglesby also went close to the home side when he cut in from the left before curling a shot just wide. Woolston was again on hand to brilliantly deny home substitute Marc Cooper as the hosts searched for an equaliser, and his 64th minute stop proved crucial. Shields countered and the ball was played through the centre for Lowther, who made no mistake from 20 yards as he calmly slotted home. Substitute Aksel Juul almost wrapped it up soon after, but his shot was kept out by Vince. Cleethorpes showed good character in the closing stages as they tried to set up a grandstand finish, but they came up against a goalkeeper in superb form in Woolston. After Luke Aldrich flashed a shot wide via a deflection for the home side, they went even closer when a piledriver from long range by Flett was brilliantly tipped over by Woolston. He later made a double save from Aldrich and Jack Richardson as he continued to frustrate the hosts, and he played a key role in ensuring the Mariners kept a clean sheet. They will travel to Workington Town in the quarter-final of the competition on Thursday, March 29. Before that, they travel to Glossop North End for an Evo-Stik North Division fixture on Saturday. The Mariners will be aiming to return to the top of the table. 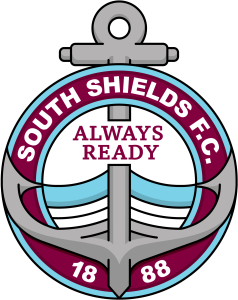 SOUTH SHIELDS: Woolston, Kavanagh, Pattison, Ross, Patterson, Storey, Guy (Minchella 69), Lowther, Armstrong (Holmes 86), Finnigan (c) (Juul 52), Mason. Subs not used: Baxter, Lough. Goals: Finnigan (14), Lowther (64). Merchandise sale: Last chance to buy items which include current badge!